The Able Act was signed by President Obama on December 19, 2014. This piece of legislation provides an opportunity for an individual with special needs to have assets over $2,000 in an account other than a trust account and not disqualify him or her for Medicaid Based benefits and Supplemental Security Income (SSI). The Able Act is an enormous boost to raising the awareness of families that they have to save and plan for their child with a disability. While the benefits to families provide a lot to be excited about and thankful for, families should be cautioned about the plan's shortcomings and be aware that it is not the solution for everyone. To read a description of the legislation, you may click these links from National Down Syndrome Society and Autism Speaks. There are many details about the law to be considered before you decide to use an Able account. The following are 3 situations in which the plan may apply. Individuals with disabilities may save money for the long-term. Currently, an individual with disabilities is penalized if they try to save money for themselves. The Able act provides them the opportunity to build investments for the long term. Building off of similar legislation for 529 college savings plans, the Able accounts are investment accounts and will have expenses associated with the plan's administration. This account should not be used as a substitute for a checking or savings account. Eliminating the need for a “spend down”. An Able account will be a great tool to use when an individual with disabilities is close to turning 18 and has greater than $2,000 in his or her name. This is because at and over age 18, an individual cannot have greater than $2,000 in his or her name to qualify for SSI. Currently there are two options: assets have to be “spent down” to get them below $2,000 or assets are transferred to a “Payback” Special Needs Trust. Abruptly spending the money down can be wasteful. Unless the assets are somewhat significant, the expense of setting up the trust can offset the benefit. Under the Able Act this money could be deposited in an Able Account. However, if the assets are significant, a trust is likely the best option. Parental awareness of savings limits and government reimbursement. The Able account may be used for parents to save for their child’s long term needs but there are trade-offs. There are limits on what can be saved annually and there are limits on the total that can be saved. In addition, there is a clause requiring reimbursement of Medicaid benefits in the event the child passes away. Content in this material is for general information only and not intended to provide specific advice or recommendations for any individual, nor intended as tax or legal advice. Investing involves risk including loss of principal. Prior to investing in an ABLE account investors should consider whether the investor's or designated beneficiary's home state offers any state tax or other benefits that are only available for investments in such state's ABLE program. Please consult with your tax advisor before investing. Goals in the IEP should be specific and concrete. Document everything and be as specific as possible. These specifics can be used to measure your child’s progress toward goals as well as make all parties accountable. When discussing transitions be sure to focus not only on the academic skills, but the social skills as well. Your child should be objectively tested in order to obtain an accurate assessment. Transition will be based upon assessment of your child’s strengths, interests and challenges. Be sure to sign and date the application. Keep records of the supports you are providing for your child.Include the smallest details of support you personally provide which are essential to your child’s well being. This will be very helpful in determining the level of supports required. You are not required to sign the IEP at the meeting, however do not reject the IEP proposal. Rejecting the IEP will waive your right to receive services. Instead, check the box Accept in Part/Reject in Part as this will keep the process in motion. Always follow up in writing. This is for informational purposes only and is not provided by, nor endorsed by, LPL Financial. 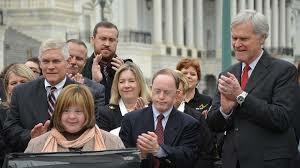 Last week, the U.S. Senate defeated the Convention on the Rights of People with Disabilities (CRPD). It was yet another brutal disappointment for Americans with disabilities. Sadly, despite the fact that America passed the Americans with Disabilities Act (ADA) twenty-two years ago, Americans with disabilities are no more likely to be employed todaythan they were before the ADA was the law of the land. Billions in both private and public sector dollars were spent post ADA to fix sidewalks, transportation, and entrances to buildings so that people with disabilities could have access to the American dream -- education and job opportunities. However, only 27.6% percent of working age people with disabilities are actually working. This iscosting hundreds of billions in tax dollars each year for disability payments. What's wrong, and why isn't more being done to end this crisis? Thirty- seven years ago, America passed the Individuals with Disabilities Education Act (IDEA). IDEA mandated to state and local governments that children with disabilities had a right to a Free Appropriate Public Education (FAPE) that prepares them for further education, employment and independent living. Since then dedicated public education professionals -- teachers, therapists, superintendents of Public Instruction and others have gone to Herculean efforts to provide services for children with special needs. Likewise, children with disabilities themselves, with strong support from parents, have gone enormous lengths to prepare for work and independent lives. The result is that many of today's young adults with disabilities have been able to accomplish vital academic and life skills and are ready for work. Additionally, because of breakthroughs, people who are blind or are unable to speak on their own can now use technology to succeed in ways previously only imagined. Still, at age 22, when services for young Americans with disabilities run out, many can find themselves like a player in a game of musical chairs where when the music stops and there simply aren't enough jobs for them. They're out. Only this isn't a game. It's life. With urging from Congressman George Miller, the Government Accountability Office (GAO) recently identified and evaluated 45 federal government programs that are intended to support employment for people with disabilities. Bottom line, our government's solutions for helping Americans with disabilities achieve the American dream -- work and independence -- are a mess. Coordination, performance metrics and transparency are desperately needed. Thankfully, a talented bipartisan group of elected officials are now really bringing to focus on these issues. Senator Tom Harkin, Chairman of the HELP committee, is leading the way in the Senate with ranking member Senator Mike Enzi. In the House of Representatives two prominent Republicans, Rep. Cathy McMorris Rodgers and Rep. Pete Sessions, both of whom have children with Down syndrome, are considering solutions through the prism of fiscal conservatism. The White House issued an executive order to hire a 100,000 qualified people with disabilities for open government jobs over time. Still, President Obama has yet to personally address this issue in a public forum. He can do much more. At the state level, however, Gov. Jack Markell, Chair of the National Governor's Association, has made solving these challenges into his chair's initiative. His exciting work, A Better Bottom Line: Employing People with Disabilities, focuses on the employment challenges that affect individuals with intellectual and other significant disabilities. He is bringing together public, private sector and non-profit leaders to come up with creative and bipartisan solutions that can enable people with disabilities to go from being dependent to independent. Academic groups and healthcare providers, including the Association of University Centers on Disabilities and the Kennedy Krieger Institute, are also doing their part to learn how to prepare young people with disabilities for jobs and independence. Today millions of Americans with disabilities who are educated, capable and willing are relegated to a life of miserable payments from the federal treasuries whose coffers are already bare. However, what they really need instead are transitional supports and an employer willing to see their ABILITIES, and not just their disabilities. As has been shown by Walgreens, Specialisterne and other companies that have hired people with disabilities, these employees can be exceptionally reliable, talented and profitable workers. America can't afford financially or morally to pay people to stay home when supports to accommodate their special needs can enable them to work and be independent. There is a long way to go to solve these challenges and it cannot be done by the government alone. But enabling Americans -- including those with disabilities -- to achieve the American Dream is a goal worth fighting for. Jennifer Laszlo Mizrahi, who has a disability, is the co-founder of the Mizrahi Family Charitable Trust and is also the Founder & President of Laszlo Strategies. Mizrahi does not have a financial stake in this topic. Her firm and her charitable trust work to further causes related to medical science and disabilities.